Alexandra Hospital | A balanced diet . . . I can hardly believe it. Today is exactly one year since I slipped on black ice and broke my leg. So how did things pan out over the subsequent 12 months? 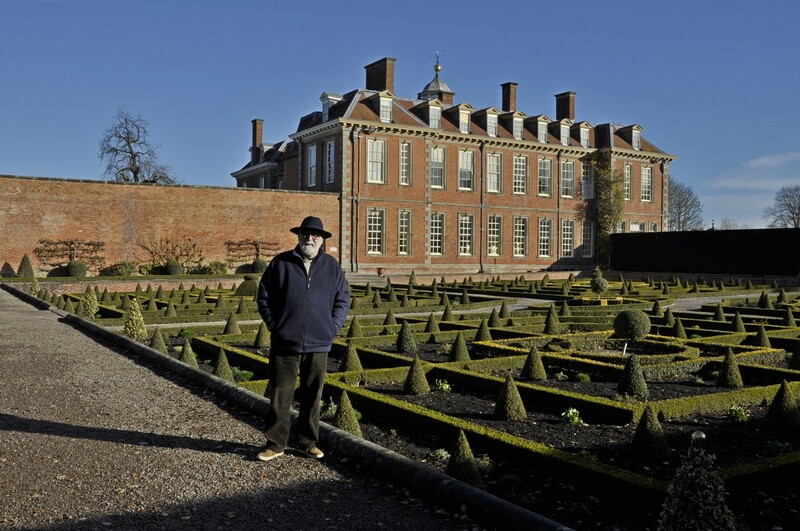 Enjoying a walk at nearby Hanbury Hall on my birthday in mid-November 2016, sans walking stick! It all happened in the blink of an eye, at 08:35 on Friday 8 January, and was taken to Redditch’s Alexandria Hospital, where I received excellent attention and treatment (in contrast apparently to this year in Worcestershire hospitals). Late on the following night, I had an operation to repair the displaced fracture in my right fibula, and strengthen the ankle. I was allowed home late on the following Monday afternoon. Over the course of the next three months I made three more outpatient visits to the Alex, and had several physiotherapy sessions at the local Princess of Wales community hospital here in Bromsgrove. For a couple of months I was not allowed to put any weight on my leg whatsoever, and I spent all that time downstairs, sleeping on the sofa. Fortunately we have a downstairs toilet and washroom, and our kitchen was close by as well. I got around using a walking or Zimmer frame. Once my third cast was removed and replaced with a support boot, I was able to get around using crutches, and started to get out and about on a short walk each day. Once the boot came off, at the end of March, I was given the all clear to drive once again. I had expected to be given some sort of certificate. All the surgeon said was that if felt confident and able to brake the car in an emergency (since that would use my damaged leg), then I could get behind the wheel again. Freedom! And also to start walking more positively using a walking stick, which I used for the next eight months. Since mid-November, more or less, I have been stick-less, although I have occasionally resorted to my stick when I thought conditions outside might be a little precarious. Another fall is the last thing on my agenda! It will still take time for my leg to heal ‘completely’. Actually I doubt it will ever get back to normal. Although it doesn’t swell as if did a few months back after every walk, it has felt quite heavy and uncomfortable; not really painful, but not entirely pain free. When I was having physiotherapy sessions last March I mentioned to my therapist that the scar tissue was itching quite fiercely, and persistently, almost like an allergic reaction. The surgeon had warned me that, in a minority of cases, there was sometimes an allergic reaction to the bone plate and screws and if it persisted, then the plate would have to be removed in another operation. But not for at least two years when the bones would be much stronger and healed. I began to fear that would also be my fate. The physiotherapist advised me to take some antihistamine tablets (for hay fever), so I consulted my local pharmacist. The tablets did the job, and quickly. Itching subsided. But there was a down side, which made me stop taking the tablets. Within an hour of taking a tablet I fell into a deep depression which lasted about 24 hours. Talk about black dog. So I quickly decided to give those pills the heave-ho. Anyway, one year on, I feel really quite optimistic about the progress made. If you have read my blog during 2016, you will have seen that I have not been constrained from travelling widely, to Germany, Italy (twice), France, Peru, Colombia, Mexico, Kenya, Ethiopia, and Australia as part of my genebanks consultancy, as well as the USA for our annual vacation with Hannah and family. Now I’d also like to take this opportunity of thanking all those friends and colleagues who have followed my progress and wished me well. Much appreciated. Posted in On my mind . . .
Just an occasional whimper . . .
It’s now eight weeks—to the day—since I went base over apex and broke my leg. I’m actually quite surprised, if not a little relieved, at just how fast one’s body can heal itself. Not that it has been all plain sailing. I’ve attended an outpatient fracture clinic three times since I discharged from hospital. On the first visit, a week later, the plaster cast was removed, and the scar checked for healing. It was replaced by my lovely purple cast. A week after that, in my second appointment, that cast was removed, the stitches taken out, and a new cast (red this time) fitted. My third appointment, after another three weeks, was quite momentous. I achieved such a lot in just over an hour. The red cast was removed, I had X-rays taken, spoke with the surgeon, had a ‘moon boot’ fitted, and saw a physiotherapist who gave me a pair of crutches and checked that I was safe to manoeuvre with them, especially going up and down stairs. Since then I’ve been much more mobile, and have even been outside on a number of days for walks up and down the road we live in, and even slightly further afield. I actually managed over half a mile just a few days ago. But I only stray outside if the weather is fine. It has been frosty on a number of mornings recently. Frost and ice and me don’t go well together! I’ve also had two physiotherapy sessions at the local Princess of Wales Community Hospital. This is very convenient as I don’t have to travel the nine miles or so to the Alexandra Hospital in Redditch. The physiotherapist has checked that everything is healing as it should be, and has given me a set of exercises that I have to do several times a day. This is an interesting exercise (left) using a contraption called a Theraband. Actually it’s just a length of elasticated rubber (could I develop a latex fetish it’s so nice and soft), that allows me to stretch and flex my ankle. And of course I’m now expected to place an increasing amount of weight on the damaged leg as that will encourage the healing process. So while the breakage is held together by the steel plate, the ligaments and tendons in the ankle below the tibia will take some time to heal fully. Even after eight weeks my ankle and parts of my leg are still quite swollen, with some bruising visible. But on the outer side of my leg I can now feel the metal plate and screws through the flesh, and it feels rather uncomfortable. So while I’m no longer in any great pain, some days there is quite a lot of discomfort, and on others hardly anything at all. A bag of peas (should I have chosen ‘petit pois’?) make an excellent ice pack, applied for about 20 minutes after an exercise session. But what is clearly progress is that the physiotherapist has got me walking around the house in bare feet—but supported on crutches—to add even more weight to my leg and to get all the muscles working together properly once more. In some ways it’s like learning to walk all over again. A reply from my Member of Parliament . . . When I broke my leg at the beginning of January, I spent four days in the Alexandra Hospital in Redditch, one of three hospitals managed by the Worcestershire Acute Hospitals NHS Trust. The ‘Alex’ has not been out of the news for many months—for all the wrong reasons. Now I know there’s a lot in the media these days about the shortcomings of the NHS. One ‘failing’ hospital after another is brought into ‘special measures‘ (the situation with the Alex), the NHS is almost broke, the junior doctors are on strike. Also, there is a perception that this Conservative government aims to privatize our cherished NHS, step-by-step. In my earlier post I mentioned that the A&E department at the Alex had recently lost several of its consultants, and that the maternity unit had been closed (supposedly only a temporary measure) and its services transferred to Worcester. However, the care I received during my brief stay was second-to-none. I tweeted about that, but also felt compelled to write to my Member of Parliament (for the Bromsgrove constituency), the Rt. Hon. Sajid Javid (right), who sits in the Cabinet as Secretary of State for Business, Innovation and Skills. After all, positive outcomes need to be highlighted just as much as the negative (of which we hear all too frequently). I have unfortunately had to avail of local NHS services in recent days, having slipped on black ice outside my home last Friday and severely dislocating and fracturing my right ankle. I was rushed to the Alexandra Hospital in Redditch, after a remarkably rapid response from the ambulance service, and spent three nights there following surgery on Saturday night. At a time when the NHS is under ‘assault’ from all quarters, including, I’m afraid to say, the Government of which you are a member, as well as the continual bad press that the ‘Alex’ seems to attract, I believe it’s opportune to celebrate what is great and worthy about the NHS and those dedicated doctors, nurses and support staff who are its backbone. From the moment of my arrival in A&E, admission and stay on Ward 17 (Trauma and Orthopaedic), and visit to theatre, I have nothing but the highest praise for all the staff, who looked after me with dedication and compassion, and a good degree of good humour. Although their morale has recently taken somewhat of a battering, this did not affect their sense of professional pride in offering the best care possible. And lying there on the ward, another thing struck me. At least 50% of the staff, possibly more, were immigrants, both EU and non-EU, and of all faiths. Indeed, I believe that the particular speciality where I was being cared for would not be able to operate were it not for the support of our immigrant friends and colleagues. Mr Farage and his moronic UKIP followers, and those on the right of your party, have been permitted to hijack the immigration (and EU) debate with the result that those from outside the UK who come here to make our country a better place, are demonised. Surely as the son of immigrant parents this is a perspective you should be fighting tooth and nail to reverse. I spent much of my career working overseas with scientists and support staff from all around the world. I celebrate this cultural, ethnic and religious diversity. I deplore deeply that our society, famed for its broad mindedness and tolerance is being dragged in a direction that undermines these core values. I deplore that this Conservative government does not appear to have the stomach to take on the immigration bigots. And there I left it. Last weekend, Mr. Javid organized a job fair in Bromsgrove and there was a lot of publicity in the local press. It was that which reminded me I’d not received any reply from my MP. I thought (incorrectly, as it turned out) that he and his staff had chosen to ignore my comments. However, this envelope dropped through my mailbox yesterday afternoon. If you click on the image below you can read the full reply from Mr. Javid. It’s a courteous and explanatory letter, and (to a certain extent) agrees with the points I raised. He does duck the immigration issue since I guess he can’t deviate from the government line. Nevertheless, I am pleased to see that someone in his office did take time to address the issues I raised. While my politics (such as they are) do not align with this Conservative administration, I do acknowledge that Sajid Javid has a high and prominent profile in the constituency, and appears to be a good constituency MP. Which is saying something considering the ministerial responsibilities that he has to balance as well. A wounded badger update . . .
It’s now four weeks since I had my mishap. And while there has obviously been a lot of healing going on, I’m getting impatient to be back to normal, sleeping in my own (new) bed again, and be able to get out and about and enjoy some fresh air. It’s ironic that we had ordered the new bed from Dreams in Redditch on 3 January. The store is located about half a mile further down the road from the Alexandra Hospital, a district in Redditch we’d never visited before. I never had the slightest inkling that I’d be back there five days later, under rather different circumstances. Once and future bed in the living room. Since leaving hospital four days later, I’ve been confined to the ground floor of our home. Fortunately, with a three-seater sofa at my disposal, we were able to make a comfortable bed there. The downstairs toilet/washroom is just a few hops away (with the support of my Zimmer frame), as is our kitchen diner. So there’s been no need to even face the challenge of going upstairs. The surgeon has been quite clear in his instructions to me: no weight whatsoever on the damaged ankle and leg for at least another two weeks. A week after leaving hospital I returned to the Alex to attend the Redditch Orthopedic Clinic. Although we had a specific appointment, there was still a delay of more than 90 minutes before I saw anyone, and I beginning to become somewhat frustrated. When returned to the clinic a week later I anticipated there would again be a delay, but was pleasantly surprised when we were called to see the surgeon after only about 30 minutes. The plaster cast was removed, and the surgeon checked that everything was healing as it should be. I was quite surprised to see the extent of the ‘damage’, with a scar down the outside of my right leg (held together by 17 stitches) through which a 10 inch steel plate had been screwed to the fibula. The surgeon showed me the X-rays taken when I was first admitted to hospital. I hadn’t realized then that the fibula had completely snapped, a displaced fracture with a 1 inch break. Yikes! The 10 hole steel plate looked pretty impressive on the X-ray, as did the ‘tie’ between the tibia and fibula adding additional strength in that part of my ankle where I’d done all the damage to the tendons and ligaments. An impressive scar with 17 stitches. This is where the surgeon entered to fasten the ‘tie’ on the tibia side; just two stitches. On that first outpatient appointment my plaster cast was replaced with a lightweight one made of fiber glass bandages that react to air and harden. Much more comfortable than the old plaster one. What surprised me is the choice of colors I was offered: white, black, blue, red, purple or pink. I chose purple that time, and a week later when I returned to the clinic to have the stitches removed I wanted the blue, but had to settle for red. Pink was a color too far! So here I sit in my chair, with my leg in the air. It still hurts more than I’d expected by this time, but at least I can move it around and find more comfortable positions. I return to the clinic on 16 February. This red cast will be removed, and it’s likely that a ‘boot’ will be fitted after which I should be able progressively to put some weight on the leg. Hopefully I’ll be approaching normality by the middle of April, but the surgeon did warn me it would be a long, slow recuperation as it had been a nasty fracture. Patience is not one of my better virtues, but I’m learning. Screaming like a wounded badger . . .
Well, I’ve never heard a wounded badger, but that’s what one of my neighbours told me I sounded like. It was a week ago yesterday, Friday 8 January, just after 08:30. I’d just finished my breakfast and saw there were a few items of rubbish to add to the recycling bin that was already outside the house waiting for the bin men later in the morning. So I took them out. We’d had a frost overnight, and I could see the frosted roofs. What I didn’t see was the black ice on the pavement. And the next thing I knew I was on my back, looking up at the sky, and screaming at the top of my lungs. From the intensity of the pain in my right foot I knew something wasn’t quite right. I had waved to our neighbour Pat across the road who was working at her kitchen sink, but she apparently didn’t see me go base over apex. So it must have been a minute or so before she saw me on the pavement and came out to investigate. By then, my next door neighbour Kath and her daughter Sophie were on the scene. As my wife Steph has a hearing problem, she hadn’t heard the racket I was making, and had to be fetched—utterly bewildered. But ever the committed blogger that I am, I asked her to quickly fetch the camera and record the goings-on for posterity! Now Kath is a theatre sister at the Royal Orthopaedic Hospital in Birmingham, and Sophie has just finished her nursing training. They were great, fetching blankets from the house to keep me warm, and contacting the emergency services for an ambulance. An ambulance arrived after about five minutes, and it very quickly became clear that I would need a trip to Accident and Emergency (A&E) at the Alexandra Hospital in Redditch, just under nine miles away. Little did I expect the further drama that would ensue. The two young ambulance technicians quickly had me inhaling laughing gas (nitrous oxide, N2O) while they removed my slipper and sock. From the odd angle of my foot it was clear there was a dislocation. But what other damage had I done? A second ambulance was called, because the crew of the first were not licensed to administer morphine. And, in any case, they jokingly said I was too heavy to lift off the ground. The second ambulance with two male crew quickly arrived, and before I knew it I was lifted into the ambulance, a number of ‘vital signs’ checks accomplished, accompanied by liberal puffs of laughing gas, and we were headed to the Alex. On arrival at A&E I was immediately wheeled into a bay and attended to. I knew that my ankle was dislocated. I didn’t realise then that there was also a fracture. But before they could do anything else, they had to get my foot straight. And this is what I’d been dreading. One of the nurses showed me how to inhale the laughing gas for optimum effect, taking deep breaths and holding the gas in my lungs. As they could see it taking effect, and on my third deep breath, one of the doctors took hold of my foot, and swiftly jerked it back into alignment. They then proceeded to wrap my foot, ankle and leg in plaster. Pain? It certainly brought a tear to my eye. Then, with a cannula inserted into my wrist, they gave me a strong dose of morphine and things seemed to settle down. I was sent to X-ray twice, and by about 2 pm a bed had become available on Ward 17 (Trauma and Orthopaedic). 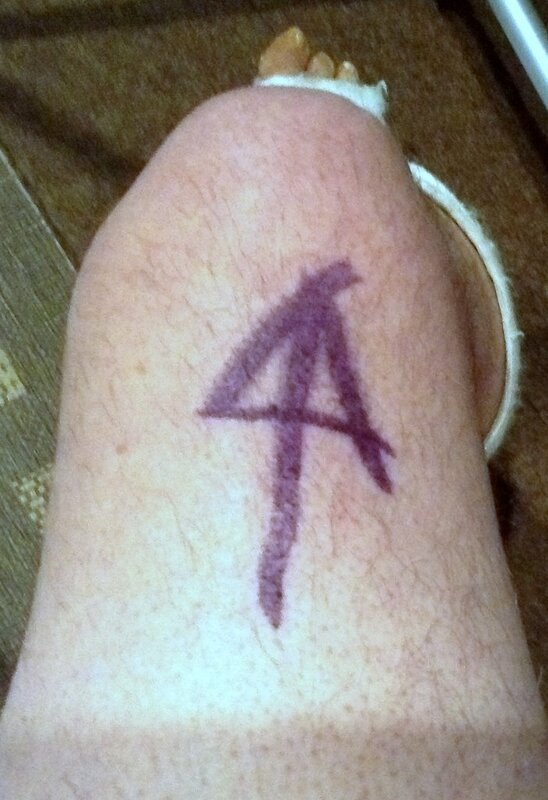 Funnily, one of the first things they did in A&E was to draw a large arrow on my right leg, just above the knee, in permanent ink, just so everyone knew exactly which side had been injured. And although I knew I’d fractured the fibula, what I had not expected was an operation to sort this out. I’d last eaten and had something to drink just before 08:30, so I was kept on a fast—NBM (Nil By Mouth) for the rest of the day, with the expectation I would go to theatre later on Friday. By 9 pm it was clear that my operation would not take place, so I was permitted a cup of tea and something to eat. Tuna mayo sandwiches have never tasted so delicious! However, I went back on to NBM at midnight so I could go to theatre early on Saturday. My operation was continually delayed throughout Saturday because other higher priority patients had been admitted for emergency treatment. Anyway, my turn came around just after 8 pm. By then I was climbing the wall I was so thirsty and hungry. I was back on the ward just after midnight, operation apparently successful. The surgeon inserted a 10 hole steel plate to repair the fractured fibula, and also tied together the tibia and fibula low down where I’d damaged all those ligaments, to provide additional strength. My leg is in another heavy cast. And so it will remain until I return next Tuesday to the fracture clinic at the Alex when I hope to have this plaster cast replaced by a ‘boot’ that will be lighter and very strong. The consultant has to remove the plaster cast in any case as he needs to observe how well my incision is healing, on both sides of my leg. I came out of hospital on Monday afternoon, and have been getting around the house with the aid of a Zimmer frame. It’s not easy and you don’t realise just how much you rely on two fully functioning limbs to accomplish even the simplest of tasks. Fortunately we have a large three-seater leather sofa (that we purchased in Costa Rica in 1976) that is comfortable to sleep on, and with a duvet wrapped round me, and with my usual pillows, I’m as ‘snug as a bug’ each night. We have a downstairs toilet and wash basin, and the dining room/kitchen is just a few hops away. So I’m all set here on the ground floor, not exactly waited on hand and foot by Steph, but she is looking after me very nicely, thank you. I’ll be like this for the next six weeks at a minimum, and the surgeon already told me it could be as long as 12 weeks before I’m signed off. There’s going to be many weeks of physiotherapy once I’m able to put some weight on my ankle. Hopefully it will be possible to arrange physiotherapy appointments at our local Princess of Wales Community Hospital here in Bromsgrove rather than having to travel each time to the Alex. And talking of the Alex, let me get a couple of things off my chest that came to mind as I was lying there on Ward 17. The Alex is part of the Worcestershire Acute Hospitals NHS Trust (along with hospitals in Worcester and Kidderminster). It’s fair to say that in the past couple of years, the Alex has been in and out of the news, for all the wrong reasons. Opened in 1985, the Alex has 360 beds, serving a population over 200,000. Due to problems in staff recruitment, the maternity unit was temporarily closed last November, and all expectant mums are now sent to Worcester. There has been a stream of criticism over poor patient care and cleanliness in the Alex. In February 2015, four A&E consultants resigned. Clearly there has been some sort of crisis, although I haven’t kept up to date with what has actually been going on. All I can say is that the treatment and care I received at the Alex, from the first minutes in A&E, in X-ray, on Ward 17, in theater, and physiotherapy, was fantastic. I was treated with respect, with compassion, and continual good humour. On Ward 17 the staff couldn’t do more for the patients. I observed good levels of hygiene; patients were never neglected, and response to call buttons was almost immediate. The other issue that came to mind very early on is that the Alex could not function—in all departments—without the services provided by EU and non-EU nationals who have come to this country and contributing to make it a better place. And I should add, persons of many faiths: Christian, Hindu, Muslim, and probably several others. It’s about time Nigel Farage and his Ukip morons as well as those right-wingers in the Conservative Party accepted the immense contributions that immigrants are making to the well-being of this country of ours. It’s time to stop denigrating them as a group of spongers only interested in benefitting from our welfare system. So although I would never choose to spend four days in hospital, it was a positive experience, and made me appreciate the selfless service, through long hours, that staff in the National Health Service provide. Hopefully I can build on those positive thoughts to help me through the next few months of recuperation. I hope it won’t be too long before I’m able to get out and about and enjoy our National Trust and English Heritage visits once again. Today, it’s exactly 12 weeks since I had my accident. Three months! How time flies when you’re enjoying yourself. I am making great progress. And that’s no April Fools’ prank. Last Tuesday (29 March) I attended my last Fracture Clinic appointment at the Alexandra Hospital. The consultant surgeon told me I was making good progress, and there would be no need to return—unless something untoward crops up. So, for the next three months I have an ‘open appointment’. The surgeon explained that the swelling in my ankle and leg is likely to persist for up to 12 months! And I do need to take care when out and about. It will still be a slow rehabilitation. Nevertheless, he has discharged me. I’m walking (with a stick) but without my ‘moon boot’, and now up to about 1 mile each walk (longer when I used the boot). I think I’ll be using the sticks for some months to come because the pavement here are so uneven. And I do fear twisting my ankle. That would certainly set me back. He told that I could now drive, provided I feel comfortable with that, and in using the brake in an emergency there’s no pain. I’m also allowed to fly, so can begin to think about my travels this year. So, yesterday, taking advantage of the beautiful weather, Steph and I went out for a short spin in the car, to The Jinney Ring Craft Centre, a few miles southeast of Bromsgrove, near the village of Hanbury. The drive was fine; no discomfort. Later this morning I have another physiotherapy session, perhaps the last one. Onwards and upwards! Since I posted this blog in mid-January, I also wrote several updates, listed below. 2 February A wounded badger update . . .
11 February A reply from my Member of Parliament . . .
4 March Just an occasional whimper . . .